A 4-part sole unit that provides a high level of shock absorption, support and flexibility. Generous padding around ankle cuff and tongue. Tongue has full gusset to prevent water leakage. Our testing for the Raichle MT Trail XT GTX Walking Boots for Women was over a number of sequential, long day walks in the Lake District. My immediate impression was of how comfortable the Raichle MT Trail XT GTX Walking Boots for Women were - the volume of padding around the ankle cuff and tongue made them supremely comfortable right from day one. More than that, the boot stayed comfortable throughout our test even when the terrain was over rocky granite. Both the upper and sole are relatively stiff so - taken with the relatively high cut of the boot - there was an excellent level of support over a variety of terrain. In our opinion the sole is stiff enough to take flexible crampons for short periods of time. The aggressive Vibram sole worked well to provide decent grip on both mud and rock. 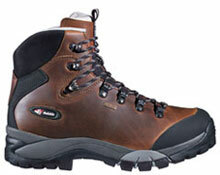 The boot is water-proof and has an excellent lacing system so it's easy to get on. The only downside was that at times my feet became very hot - I guess this is an inevitable consequence of the goretex lining. My only other minor complaint is that the rubber toe-cap has lifted very slightly on the top of each boot. This hasn't affected the functionality at all - just the look! By most people's standards, the Raichle MT Trail XT GTX Walking Boot for Women is a top-of-the-range, feature-rich walking boot. In our testing, the performance did justify the price making this a worthwhile investment if you're looking for a well-crafted, solid yet supremely comfortable Hillwalking/Trekking boot for use throughout the year.